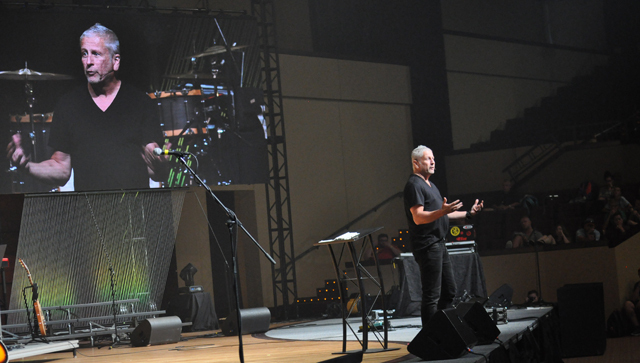 Louie Giglio, well-known pastor, author, and speaker, encouraged the Momentum Youth Conference audience Thursday evening to be resolved to know Jesus in the pages of the Word. 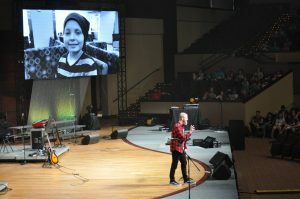 Dustin Zerwas, youth pastor at Gulfview Grace Brethren Church, Port Richey, Fla., shares the story of his son, Randall. He noted that it is 66 books, but it’s one story all about one name — Jesus. He added that the Word is a lifeline from heaven. “God is extending a lifeline. He sees you,” he said. “Keep eating this, breathing its breath off its page, even if life puts you underwater, guess what it will become to you. It will become air from heaven,” he said. Earlier in the session, Dustin Zerwas, youth pastor a Gulfview Grace Brethren Church, Port Richey, Fla., shared the story of his son, Randall. The 13-year-old died in December after battling cancer. A video filmed not long before Randall’s death showed the young man thanking everyone for praying for him. “His story does not end in cancer, does not end in death, does not end in heartbreak,” said Dustin. When Giglio took the stage, he told about meeting Randall and the Zerwas family. Giglio, who was in Tampa for a concert, took his Passion Band to the hospital to meet Randall when Randall wasn’t able to attend the concert. He said he asked the young man how he could pray for him. So he asked again. “How else can we pray?” Giglio said he asked.